I have written previously about the birth defect that I have: Spina Bifida. Because of this, I have always felt an uneasy sense of being an outsider. I have a lot of physical problems, but at the same time I am largely independent and lead a pretty active lifestyle. Many people are surprised to find out that I have Spina Bifida because as long as my braces are not visible, I seem to have no problems. I didn’t have much of a problem with being self-conscious as a child because my parents taught me how to explain my disability in a way that my friends and classmates could understand. But as a teen I started learning more about Spina Bifida. As a result, I became more aware and self conscious, mostly, I think, because almost every teenager is worried about their image in the eyes of their peers. This went on for a few years until I conducted my first sociological experiment. College gave me a good chance at a fresh start because I was a student at a new school and I only knew a few people. So, I decided I would start acting like I was comfortable with who I was and see how that affected people’s reactions to me. Something exciting and unexpected happened. The more I acted comfortable with myself, the more everyone around me became more comfortable interacting with me. This gave me more confidence and propelled the cycle forward. I share all this because I learned some valuable lessons that have helped me enjoy my life, my family, and my friends. One of the most important is to be yourself and be nice to people and most people will be nice to you. But you won’t always be liked by everyone. That’s okay and very normal. Some people are just not going to get along. Hold on to those people who love you for who you are. They will enrich your life so much. Listen to them and pay no attention to people who don’t know the real you. Love others and allow yourself to receive the love of others. My hope is that someone who reads this will find something to take away from my rambling that will help you learn to love yourself for who you are, and to accept and treasure the love of your family and friends. 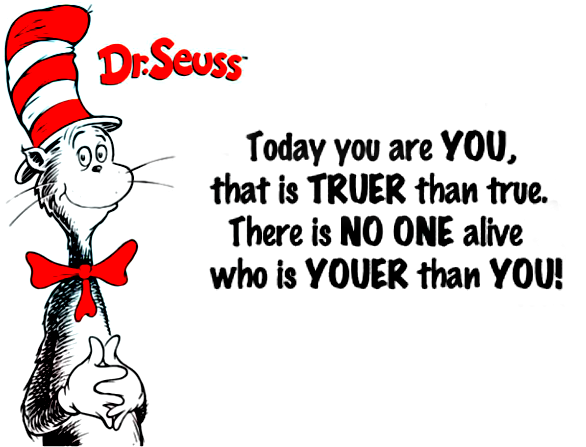 Lastly, I leave you with a very appropriate Dr. Seuss quote.